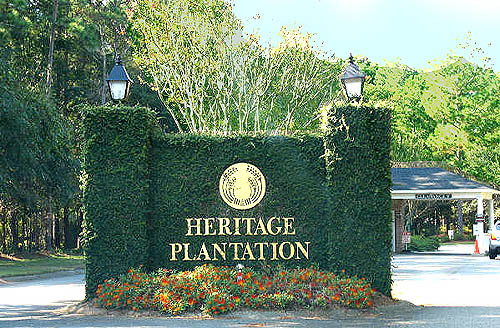 Nestled between the Atlantic Ocean and the Waccamaw River, Heritage Plantation exudes southern charm and hospitality. From the minute you drive through the gated entrance among the ancient oaks dripping with Spanish moss, you feel right at home. There are a wide variety of homes from patio homes starting at $380,000 to riverfront estates priced to almost $2,000,000. The popular Heritage Golf Club is part of this gated community of about 500 homes which is built on the site of the Midway and True Blue Rice Plantations. At The Landowner’s Cemetery, you will find the preserved graves of planters and slaves. Tennis Leagues offer Men’s Singles and Doubles, Women’s Singles and Doubles, Mixed Doubles, and Day and Night Tennis. Golf Groups have Heritage Club Men's Golf, Heritage Club Women’s Golf, Weekend Warriors, Men’s Golf at Area Courses, Prime Time Lady Niners, Ladies from the Area Who Play Nine Holes at Heritage Golf Course, and Monthly Couples Golf and Dinner Open to All Residents. Marina activities include boating, fishing, Happy Hour – watching Sunsets from the Marina Deck, swinging in the Crow’s Nest, parties on the Marina Deck boat convoys to Charleston and other sites on the Intracoastal Waterway, and party in the boat. Club Committee, Book Clubs, Dinner Groups, and Heritage Plantation Historic Preservation Foundation. Community parties include Annual Welcome Social for New Residents, Holiday Gala, Get Lit Party (In December we have the lighting of the boats at the Marina), and Holiday Gala. Owners’ Clubhouse activities include Bridge, Beginners and Duplicate; Couples and Ladies, Poker, Men’s and Pizza Poker, Trivial Pursuit, Canasta, Dominoes, and Ladies Bridge. Beach fun includes beach walking, surfing, and shell collecting on Pawleys Island Beach. Community residents volunteer for a number of charitable organizations as well.